I'm really thrilled with the new design I'm using for hats. 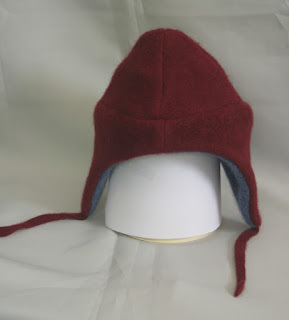 It makes a really cozy hat with flaps to keep the ears warm. For little ones I'm adding ties, and it's so cute to see their little round faces surrounded by the hat. I love this use for recycled sweaters! These are from a gorgeous wine colored cashmere sweater. 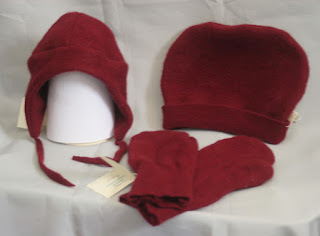 I made them last Thursday and the mittens and cuffed hat sold on Friday. I like the contrasting lining on this one. These were made from a really cool striped sweater. Really fall-ish colors. 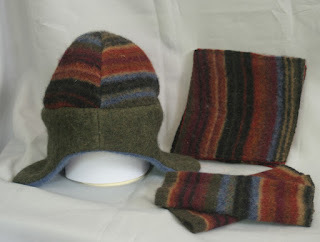 The earflap hat is lined in cashmere. 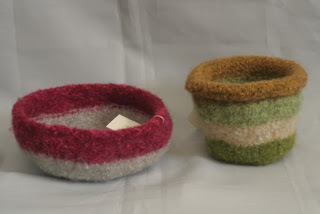 These bowls below are ones I knitted and felted. I've been having a lot of fun seeing what shapes I can make and combining the colors.